Kumisolo started collaborating with Swedish tropical band Joe Davolaz by singing on their « Cha Cha André » EP. Attracted by their warm and authentic sound, she decided to meet them in Stockholm and record the arrangements for her second album « Kabuki Femme Fatale ». By jamming together in Tropiska studios, a true alchemy soon operated between Kumi’s bitter sweet pop compositions and the band’s live vibrations. Listening to « Kabuki Femme Fatale », music lovers will probably tell their common fascination for timeless pop artists, such as Haruomi Hosono, Martin Denny, Françoise Hardy or the synthpop trio Antena. 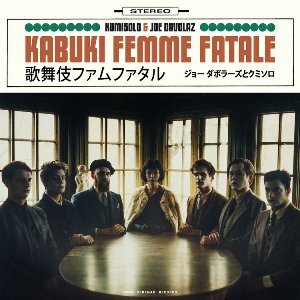 Like a psych-pop concept album rescued from a time capsule, « Kabuki Femme Fatale » brings you a kaleidoscopic reading on the modern woman with unique hypnotic sounds.